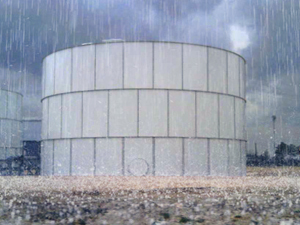 About Superior Tank Solutions, Inc.
Home › Uncategorized › Is Super El Nino Coming? Is Super El Nino Coming? California and the Western US have been in the midst of a severe drought with water storage supplies becoming dangerously low. Fortunately there may be a big relief coming in the way of a Super El Nino. As of June 2014 the International Research Institute for Climate and Society (IRI) has updated the El Nino System Status to a “El Nino Watch”. The IRI predicts the chance of an El Nino for the Northern Hemisphere to be 70% summer and increasing to 80% this winter. The effects of El Nino throughout the US could be dramatic. For example in parts of Southern California rain totals could equal 172% of Normal Precipitation. For parts of Northern California totals could reach 145% of Normal Precipitation. Other areas such as Washington D.C. could experience decreased snowfall amounts and the National Oceanic and Atmospheric Administration (NOAA) predicts hurricane season to be near or below normal levels. El Nino has not arrived yet and the situation is still unpredictable but conditions continue to be favorable. Many utilities and water districts are already preparing for a wetter than usual winter. Routine maintenance such washouts, dry inspections and coating rehabs have been postponed for several years due to high fire danger and low water supplies. An El Nino winter is the perfect time to catch up and prepare tanks so maintenance is not required during the next drought. Many sought after maintenance contractors are reporting their winter schedules filling up fast due to higher demand. Call today to schedule your tank washout or coating inspection today! ALSO ASK ABOUT OUR NEW MIXERS TO MAINTAIN WATER QUALITY DURING LOW DEMAND PERIODS!! ‹ Smaller size, smaller price, same BIG results!